Greece charter motor yacht 'Anatolie' is a 40-ton motor sailor yacht which is ideal for 8-10 charter guests overnight and up to 49 for day sailing cruises. 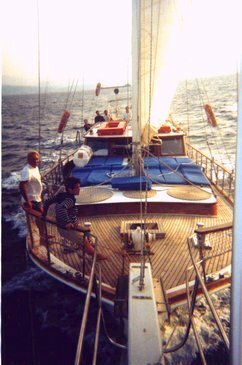 She was built from wood in 1996 in the Southeast Aegean Sea. 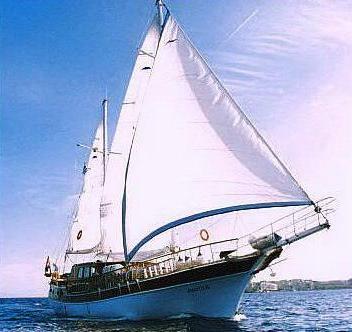 She is registered as a professional charter tourist vessel and accordingly is authorized to carry a daytime capacity of 49 persons for sailing cruises in Greece. Yacht 'Anatolie' is more than 20 meters long and 5.45 meters wide, allowing ample living space for a small group of ten or so passengers of all ages. Greece charter motor yacht 'Anatolie' is suitable for long distances, Anatolie and her skipper have sailed the entire Mediterranean and as far as the Canary Islands in the Atlantic. Her bow also offers 11 deckchairs for tanning or relaxing. Her stern has a large removable table. The stern can also be set up for cocktails, dancing or karaoke. 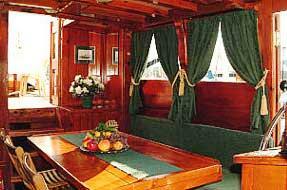 There is also an interior den for charter guests. When you are aboard the Anatolie you can comfortably lounge on the stern, enjoy a well-deserved ouzo, with a sampling of starters served by the person who will prepare your meal. Now is the time to perfect your itinerary with Alex, your captain. “Helios disappears slowly on the horizon. 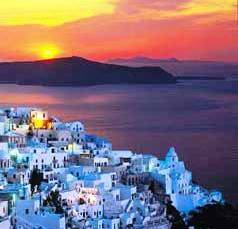 You see a necklace of islands in the distance… You hear the chords of bouzouki coming from the quay… You're in Greece. Your captain, Alexandre from France, speaks Greek and dances the zeibekiko, but also speaks English and "bastante italiano per besogna mia". 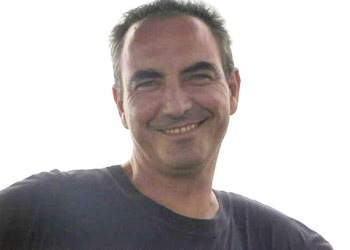 His father is of Greek origin, from a lost island in the southern Aegean. 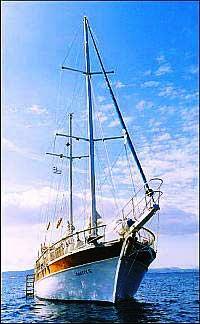 On motor yacht 'Anatolie' full living charter accommodation is available for up to 12 charter guests. 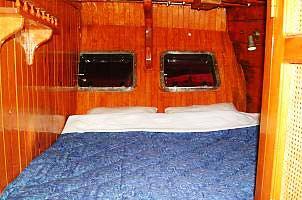 There are 2 double cabins (double bed), 2 triple cabins (double bed and single bunk) and 1 twin cabin (bunk beds) aboard. While three of the cabins on motor yacht 'Anatolie' have private toilets and showers the other two share a toilet and shower. 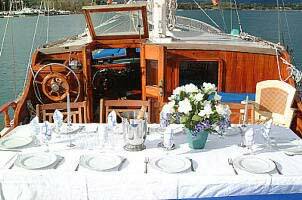 A yacht charter group of 8 to 10 people is ideal (12 maximum). Soft side baggage is preferable. Extras aboard the charter yacht include a motor tender, Karaoke, music etc. Prices are calculated on the basis of a one-week minimum plus additional days. For example, if you wish to organise a 10-day cruise, the price is that of one week plus three days. 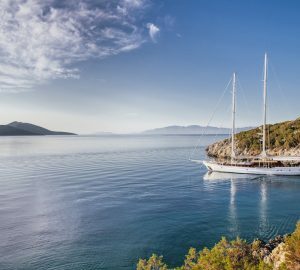 On the archipelago of Sporades, prices are calculated on the basis of a ten-day minimum, with 7 days in the Cyclades or the Saronic Gulf. If the passengers request to go through the Isthmus of Corinth, they are responsible for all tolls. Payment is made either in thirds (one-third deposit at the time of reservation, one-third deposit one month before departure and one-third upon boarding) or in halves (50% deposit at the time of reservation and 50% upon boarding). Prices include: - Rent for the entire boat plus insurance - Crew fees - Port taxes and other taxes - Water and fuel - Daily breakfast and one meal (lunch or dinner) on board Subject to availability, you can reserve on the dates of your choice and start or end your cruise on a weekday if you like. 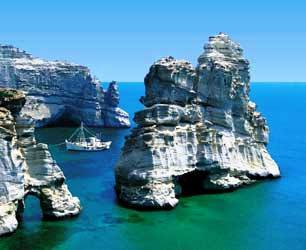 This offer is possible because, when not on private cruises, the Anatolie provides daily excursions. Boarding begins at 5:00pm and disembarkation is at 9:00am on the last day. For pricing purposes, days are counted according to the number of nights spent on board. For example, if you reserve for one week and board on Saturday afternoon, you will land on the following Saturday morning (day 8), having paid for seven days. Included in the price are a welcome aperitif the first evening, daily breakfast and one meal daily (lunch or dinner). The itinerary is flexible, according to your wishes before and during the cruise. If, however, the initially agreed-upon itinerary is extended or if this flexibility causes motor usage for more than an average of 4 hours per cruise day, you would be charged a supplement for the fuel (this rarely happens.) The captain validates the itinerary according to security imperatives, weather and the return date. If you arrive by air, a representative will meet you at the Athens airport (at no charge).